Hopefully it won’t happen very often, but when Amazon and others finally get fully fledged drone delivery services off the ground, there’ll be occasions when the flying machines suddenly drop out of the sky. Whether it’s inclement weather, a software malfunction, or some ne’er-do-well with a catapult and a rock, we have to accept that those multi-copter contraptions will sometimes get into difficulties and fall all the way back to the ground. It’s one of several challenges that gives the Federal Aviation Administration folks sleepless nights as they consider the safest way to let companies and organizations use the popular technology as part of their operations. But Amazon may have the answer. The online shopping giant is exploring an innovative system that would cause an airborne drone that’s in difficulties to disintegrate in mid-air, minimizing the force of the potential impact on any human, animal, or object on the ground. The idea is outlined in a patent granted this week by the U.S. Patent and Trademark Office. Titled “direct fragmentation for unmanned airborne vehicles (UAVs),” the document describes how a malfunctioning drone could dismantle itself in the sky after assessing the conditions on the ground. “The fragmentation sequence includes a release timing and a release location to fragment away (e.g., release, drop, jettison, eject, etc. away) one or more UAV components in case the flight operation of the UAV is disrupted,” the company says in the patent. Conditions that could cause problems for a delivery drone are listed as “unexpected heat, cold, wind, rain, hail, high or low (e.g., barometric) pressure regions, or other meteorological conditions.” These could affect the drone’s rotor system, flight control computer, battery, flight sensors, or other components, resulting in a major malfunction that makes it behave more like a brick than an aircraft. Amazon says the fragmentation sequence would happen automatically, and that depending on which parts of the drone are jettisoned, “the weight, speed, air drag coefficient, and other factors related to the UAV can be altered.” This suggests that the drone wouldn’t always completely disintegrate. Rather, it would in some situations only eject the parts causing the problem if it allowed the damaged drone to make a safer landing. We’re assuming the system would also do its best to ensure that whatever it’s carrying — several textbooks for a delivery, for example — is jettisoned away from anyone its sensors detect on the ground … providing it’s not its sensors that are malfunctioning. 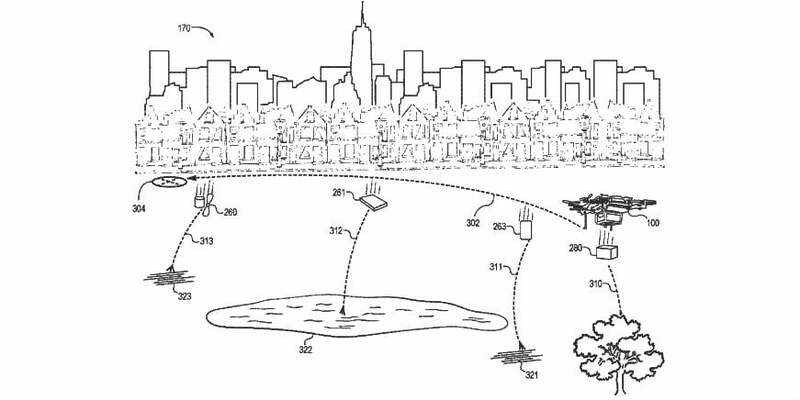 It’s an intriguing idea, though Amazon has been filing a lot of intriguing ideas related to its delivery drone ambitions, some more outlandish than others. Check out this city-based drone tower that would look — and sound — like a giant beehive. And if you want to go full bonkers, then this patent for a “flying warehouse” should tickle you. There’s no telling whether this latest idea will become a thing, but it nevertheless offers some interesting insight into how champions of the technology are hoping to overcome the great challenges that lie ahead.